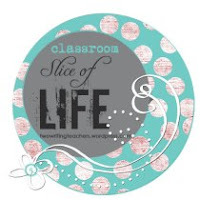 Last year I dove in and joined Two Writing Teachers Slice of Life Challenge. I had read the monthly slices, but never posted any of my own writing. After seeing Ruth Ayres at the Dublin Literacy Conference, I decided I was going to try it. Since I was going to give it a try, I thought, why not bring my students along with me. I made little Slice of Life journals for each of my kids and we wrote through the month together. The experience turned out to be so much more than I ever imagined. Our writing community became even closer and writers who previously had just gone through the motions of writing workshop were transformed. The power in writing every day and receiving feedback from other writers changed their view of writing. They began to really see that their voices mattered. Fast forward one year and it's time again for the challenge. This year, my fourth graders are quite savvy with blogging and I'm feeling a little more confident now that I've got a year of slicing under my belt. I'm giving them the choice to either blog or write in their Slice of Life journals, or do a combination of the two. In addition, two other classes are joining us as well as our principal. (How cool is that?) I'm going to put the kids into small writing groups to comment on each other's writing and our three classes will get together periodically to share our work. All in all, we will have about 85 kids, 4 teachers, and our principal writing every day in March. Our writing community is going to be amazing! If you are interested in joining the Slice of Life Challenge or classroom challenge, check out Two Writing Teachers. There is a specific link for the classroom challenge and another post about starting your own blog. I'm looking forward to connecting with other writers this month, getting back into the habit of writing every day, and sharing the experience with the young writers in my room. I love that you and your kids are making special journals tomorrow. Please post pictures of them! Thanks for virtually inviting me into your school. 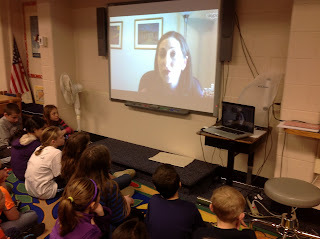 The kids came prepared with fantastic questions! I cannot wait to read their slices. BTW: I blame the insanely bright lighting on being in my husband's office. We did a little trading home office spaces this week, http://raisealithuman.wordpress.com/2013/02/24/the-saga-continues-my-keyboard-tray/. I didn't realize just how bright it was at the time. I tell you about some challenge. But those challenges were not for me due to ever see my best assignment service hence its the time when silence is maybe a challenge that was not only for me because here its not good for others.